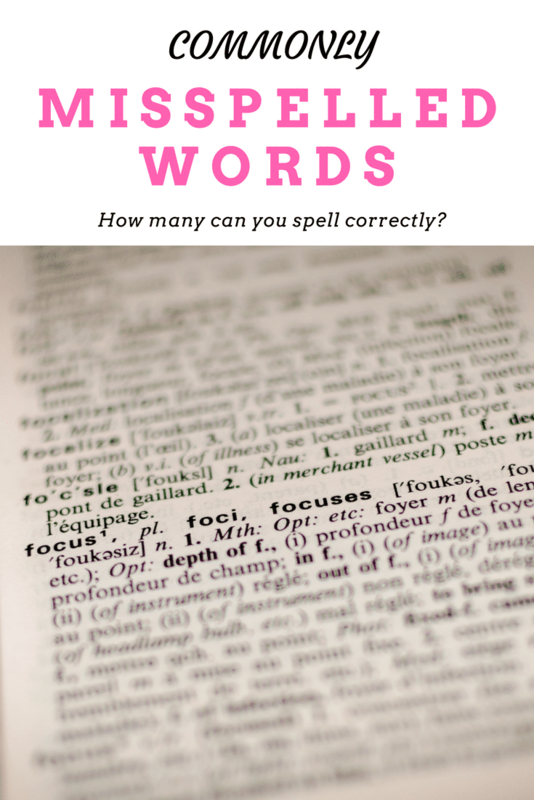 Commonly Misspelled Words: How Many Can You Spell Correctly? Lady and the Blog → Personal Blog → Commonly Misspelled Words: How Many Can You Spell Correctly? Commonly Misspelled Words. The bane of my existence. Hey! Just being honest!! But you know what? Writing this post gives me the giggles because it’s all just so sad! I hate to admit that even though I am a writer, there are so many words that I cannot spell when left to my own devices. Thank GOODNESS for Grammarly! That tool is a life saver. Back to commonly misspelled words. I asked my Facebook friends what words they have trouble spelling and guess what? I couldn’t spell ANY of them correctly on my own. EEK! After our quick online chat, I thought that I’d place the list of commonly misspelled words in one places so you can see how you’d do against the grouping. This isn’t an official list by any means. This is not a joke. Literally, every single one of these words is on my “do not fly” list. Please tell me that these commonly misspelled words are hard for you as well! PLEASE! Ok, if I am being honest, out of all of these commonly misspelled words … I got three RIGHT. License, broccoli, and vacuum are not an issue for me. But the rest? Oy vey! I can’t handle it. Have any that you’d like to add? Leave them in the comment below.